The cool thing to do over the last couple of years has been for indie rockers to team up with under-appreciated blues or soul artists to create something new. Jack White did it. Drive-By Truckers did it. Now Toronto's own The Sadies are doing it with Andre Williams for the new album Night & Die. Initially, the pairing of Williams' blues with The Sadies' root rock would seem to be a bizarre match. However, as you listen to the record, you come to realize that both styles of music have an innate sadness to them, which makes them a perfect combination. As much as I love The Sadies, they are definitely the supporting act to Williams. And that's the way it should be. The album is predominantly blues-based. The band adds some shuffle and twang, but always in a complementary role. Only once, on "One Eyed Jack", do they break into their characteristic roots rock. The strongest element of the album is likely Williams' lyrics. Sure, he only writes about a handful of subjects, jail, lack of money, and jail, but he does it with a rawness and wry sense of humour that is impossible to resist. You think you've got problems? They're nothing compared to what the 75 year-old Williams snarls about. Just listen to "I Gotta Get Shorty Out of Jail". Even the backing vocals are exceptional. They add a soulful, quasi-gospel touch to many of the songs, giving them a more rounded, full-bodied feel. Add an odd couple female vocal to Williams' growl on "That's My Desire" and you get a duet that verges on romantic. Credit goes to The Sadies who have stepped out of their comfort zone with Night & Day and as a result have created something truly special with Andre Williams. Best tracks: "I Gotta Get Shorty Out of Jail", "That's My Desire"
"Now Toronto's own The Sadies are doing it with Andre Williams for the new album Night & Die." 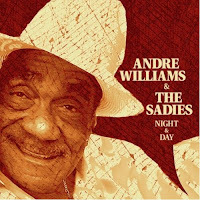 I guess you've not heard Andre Williams and The Sadies earlier record from 1999, "Red Dirt." So, there isn't really anything new to this collaboration. Also, aren't The Sadies known for their collaborations with other artists like Jon Langford, Neko Case, Neil Young, Gord Downie, and John Doe just to name a few? Again, nothing new here going on. Your premise, therefore, should be tossed and you should consider a review of the record based on its inherent merits, not as a marketing ploy. It was pretty obvious that I was extolling the merits of the music.